Look no further for a unique and oh-so-good holiday gift! 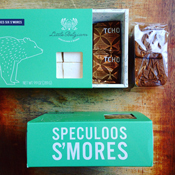 This elegant gift box is brimming with Speculoos, a traditional Belgian spiced biscuit handmade by Belgian expatriate Eva Ballegeer in her small Berkeley, CA-based bakery. The cookies get their name from the word speculum, Latin for mirror: each speculoos is the mirror image of the mold it's made with. Especially popular around the holidays, the buttery, crisp cookies are made from all organic ingredients and flavored with warm spices of cinnamon, clove and cardamom. Selfishly savor each bite.....or give a box as the perfect happy for neighbors, colleagues or teachers. Each box contains 32 speculoos cookies. From her bakery in Berkeley, California, Evy Ballegeer thoughtfully creates spicy, crispy bites that are traditional coffee and tea accompaniments in her native Belgium. Speak with Eva, and you'll enjoy a warm conversation that also imbues every bite of her cookies. How did Evy bring Belgium to Berkeley? "When I moved to the US, I was working as a correspondent and a journalist in New York. I wanted a change, so I went to culinary school at Tante Marie's in San Francisco with no pre-determined goal in mind. During that time, I noted the re-emergence of artisanal food and that people were very eager to get back to the roots and traditions of food. I observed the resurfacing of classic European recipes. I never really set out to be the owner of a cookie company, but I kept trying to think of what I could uniquely bring to this movement. I thought back to the foods I reached for when I first moved to the US from Belgium and was missing home. I realized that when I was feeling nostalgic for my childhood, I would always grab speculoos." In Belgium, coffee or tea are regularly enjoyed around 4pm, and are generally served with a taste of something sweet. Often, these little somethings are speculoos (meaning mirrors, as they are perfect reflections of the wooden molds from which they are formed). Their forms are often the patron saint of the town in which they are baked. These edible pieces of art have many recipes, but Little Belgium's use only the highest quality ingredients. They are made rich and complex with organic butter and nine spices, including cinnamon, cloves, cardamom, pepper, and ginger. Evy shared how her disappointment in what was available turned into opportunity, "So I was nostalgic for speculoos, and I really looked closely at what was out there in terms of thin, crispy cookies. The speculoos I found were all mass-produced, using palm oil versus butter and other sub-par ingredients. I wanted to show others how amazing these cookies could be. Fortunately, when I was working for a pastry chef at Nopa in San Francisco, I was allowed to put some out. The servers kept returning to the kitchen because patrons were asking for more. I also got more positive feedback when I'd prepare holiday cookie boxes. There were other types of cookies in these boxes as well, but the greatest response was always about the speculoos. All of this, combined with the fact that I love the kind of crafting reflected in the molds, came together when I opened Little Belgians. Evy began with four wooden molds, made by a German artisan. "I wanted to use shapes that had something to say about my life in Belgium, so I chose an umbrella, a house, a cyclist, and a bird. The umbrella reminds me of the gray skies that are always over Belgium. The house represents a home in Ghent, my favorite city and the place I went to college. The bike racer is because everyone in Belgium watches cycling in person or on TV. And the bird pays homage to my grandfathers who raced pigeons." Most recently—just this summer, in fact—Little Belgians has elevated a camping classic. "I used to make s'mores for weddings when I was catering. Nearly everyone agrees that the flavors are good but the size isn't perfect. So, I decided to make smaller cookies and incorporate handmade, all-natural marshmallows from The Candy and small squares of also local TCHO chocolate." And naturally, these cutest-ever-s'mores are made from a wooden "campfire" mold. How do these s'mores follow? Evy shared, "They absolutely resonate with our theme. Speculoos bring people together over cup of coffee or tea. S'mores bring people together around a campfire. People are coming together and celebrating moments with food." When you gift these very special treats from The Savory Pantry, you share the spirit and tradition that are baked into every Little Belgian cookie. "We put so much care into making them," Evy shared, "To me, each one is precious." Look and taste, and you'll know this to be true.